The tutorial covers a common data extraction scenario - dowloading a product catalogue from an online shopping site. It explains how to submit web forms, work with search results and details pages, download images and extract text fragments from a raw HTML. You will learn how to schedule a project for automatic daily execution. The tutorial will also show how to emulate mouse actions and get data from a pop-up panel. As an example, we are going to collect a multi-page product catalog from the Amazon web site. Besides product description from the details page, we will collect high resolution product images. As it often happens to online stores, each product on Amazon can have a variable number of images. We will collect them all. The same approach can be used with EBay and many other online shopping sites or real estate listings. The steps of this tutorial are covered by the video. Before starting your first project, take a look at web scraping project structure and its basic elements. Find a shortcut to Data Toolbar on your desktop or in the Start menu and run the program. After starting the program, you will see a browser window with the Data Tool button in the top left corner of the browser. By default, the program opens Chrome browser but you can switch to Firefox using the dropdown menu. If you do not have Chrome installed, the program will use Firefox. Chrome is more stable and is faster in automation mode than Firefox. That is why we recommend Chrome for long running projects. If you use Chrome 57 or later, you will see a message that Chrome is being controlled by the automation software. The browser runs in the “private browsing” mode and uses a separate testing profile that does not interfere with the browser settings and history. The browsers do not load any installed extensions. The testing profile is recreated when the browser restarts. After the restart all saved cookies are deleted. You can optionally change project properties to keep cookies with the project. Chrome browser automation requires a console application chromedriver.exe (chrome automation server) that may trigger a firewall warning on the first run. You can ignore the warning. Navigate to the target web page and click the DataTool button. That will create a default project associated with the target domain. In our example, we use http://amazon.com as a start URL. Important: Please note that you need to navigate to the start URL before clicking the DataTool button. If you use the DataTool with the Chrome browser, you can click the DataTool extension icon at the top right corner of the browser window instead of the DataTool button. It provides the the same functionality. Each project requires a start URL. The start URL points to the webpage where the project will navigate when it starts. Sometimes the start URL is the primary URL of the website, but often the required data is on a sub-page. Some websites allow navigation or redirection without changing the visible URL. In such cases, you will not have a start URL that points directly to your preferred start webpage, but will instead need to add templates to your data extraction project to navigate to that webpage. If your target web site requires a login, you have two options. First, you can sign in before starting a project using the browser and then set a start URL. You will have to sign in each time when you restart the program. Alternatively, you can set the login page as a start URL. Use the second scenario if you need to schedule an automatic execution of the program. In this case, the start URL must be a direct URL and should not contain any session information. The Project Properties window allows you to set a list of multiple start URLs. The default project file location depends on the start URL domain. By default, the project designer saves the project using the target domain name. If needed, the default domain project can be saved under a custom name using the Project Properties screen. Custom projects can be opened using the drop-down menu. Besides the project itlself the program saves the image of the starting and the cookies from the last session. Projects are saved automatically when you close the Project Designer. At any stage of project design you can press the Get Data button to test the project. If the current URL is different from the starting URL, the browser opens the starting page in a separate tab or in a separate window. It usually takes from 2 to 10 seconds to process a page. A project that needs to go through thousands of pages may take several hours to complete.The data collection process can be terminated and the collected information can be reviewed without waiting for project completion. A data collection task can be scheduled for automatic execution in command line mode. The browser interacts with the target web site as if it was controlled by a user. When the program imitates a mouse click, the browser steals input focus from other applcations. That makes it difficult to use the computer while the tool is collecting data. The Data Toolbar allows the operator to get data by running a headless browser in the background with no visible interface. 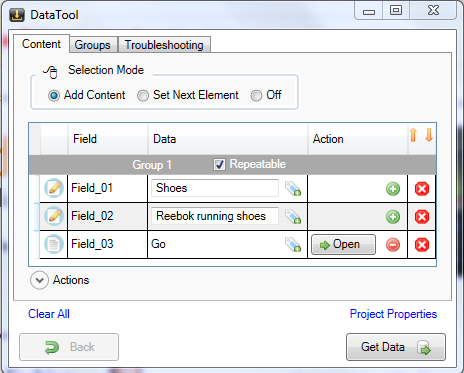 The background data collection can be started using the Get Data button dropdown menu. In background mode the program uses the headless browser mode supported by Chrome and Firefox. In the meantime the primary browser stays inactive. The headless browser cannot reuse session information and browsing history from the primary browser. For password protected web sites include a login template into the project. The first "cold" run of the headless browser requires some time to get started. Subsequent runs start faster. When the template editor is open, all navigation and interaction with the browser must be done only through the project designer. The designer will emulate all mouse and keyboard events based on your input. In design mode moving your mouse pointer over the web page automatically highlights page elements that can be marked as data fields. Clicking on a text field, a link or an image automatically creates a new row in the data-grid. Clicking on a link does not cause navigation. As you select new fields, additional columns are automatically created. You can remove added content or edit its properties. If for some reason you need to interact with the browser directly, set Selection Mode to Off. When the first input-button element is added to the template, the program automatically attaches an action to the element. You can always remove the action or add it to another element. Information from elements with attached action or input elements is not collected. To move forward between templates, use the Open button. To move to the previous template, press the Back button. Do not interact with the web page or the program while the program is busy (while it displays a spinning wheel). Each time you restart the program, the browser forgets the login info. If you set the project to clear cookies, you will always begin in the same signed out state even if you do not restart the browser. The main element of the project designer is the list of content elements. There are five columns in the list. The icon that you see in the left-most column shows the type of the element. Clicking on the icon opens the Element Properties window. The “Field” column is an editable name of the element. “Data” column shows collected or input information. “Action” column shows if there is an attached action. In most cases, an action is an equivalent of the mouse click on the web element. Clicking on the action button opens a new template. Actions are automatically attached to submit element when the element is selected. You can manually attach or detach an action to any element but most often that will be a link element. The last column of the grid is the delete row button. Each group of content elements has a separate section in the list. The section header shows the group name, the group “is repeatable” property and the number of matching rows of data (items) per page. The next step is setting input values for “Search-in” and “Search-for” elements (Field_01, Field_02). To set a drop-down selection or input text, type in the desired value into the Data column. Optionally, you can enter more than one value (one per line) using the Element Properties Window. The program will automatically submit the form for all combinations of entered values. Press the Open button in the data-grid to submit the input. The program will select the drop down item, key-in the “search for” string and then click the Go button. The browser will submit a search request and navigate to the search results page. Wait for navigation to complete before going to next step. When the previous action is completed, the browser shows search results and the project designer opens an empty template. You can return to the previous template by pressing the Back button in the designer (not in the browser). If all data that you need is on the page, add content elements, set a paging element and run the project. All selected elements will be included in the final output. Note, all selected elements have to belong to the same list item. To iterate through the details pages, choose any link to the product details page and click on it. The program will add a link to the list of content elements. To navigate to the details page associated with the link, attach an action to the link by pressing button. When DataTool runs the project, it will open and process a details page once for each link in the list. Elements with attached actions are not included in the final output. The Actions section in the bottom of the window allows you to see and fine-tune template actions. You can instruct the program to open the details pages in a new tab. That usually improves program performance, because it does not need to navigate back each time it processes a details page. Than feature works best with Chrome. In case of the Firefox, that option causes problems in Design mode and it should be set only after your project is complete. Search results usually have a Next Page link that opens the next page in the navigation set. If this is the case, set selection mode to Set Next Element and select the Next Page link in the web page. The program will add a new group that has only one element with an attached Iterate action. If you trigger the Iterate action, Data Tool will not actually open a new template, but the web browser will navigate to the next page in the search results. Tip 1: Sometimes, there are only page numbers “1 2 3 ...” and no any “Next Page” element on the page. In this case you can select “2” as a next page reference. The program will auto increment this number and will go through all available pages. Tip 2: Sometimes, additional content is loaded when the page is scrolled to the bottom. In this case, you need to select any stable element (i.e. html/body) as a Next element and set action Command to Scroll. On the Troubleshooting tab set Exclude duplicated items checkbox to on. If we press the Get Data button now, the program will submit the request and go through all the product pages. The final output will nonetheless be empty because we have not selected any content elements. All elements that we have selected are either Input or Action elements. Data from Action and Input elements is not included into final output. Press button to remove the action associated with the Details Link. That will transform the Action element into the Content element. If we press Get Data button now, the final output will get all the product titles from the search results. Run the project and view the results. Then press the Back button to return to the Template Editor screen. Restore the action associated with the Details Page link by pressing button. Click the Open button to navigate to the Product Details page and open a new empty template. When navigation is completed, begin adding content elements for all the content you want to extract from the details page. Just highlight and click on the elements you want to collect. Remove automatically attached actions if you do not need further navigation. Sometimes, Details pages show a varying amount of details for different items. For example, in a product catalog some products may not have dimensions or weight. In this case, the positions of the data fields inside the web page shift from item to another. That happens because web pages do not reserve space for missing data. However, web data extraction software uses position information to search for data fields and if their position changes, the scraper may extract wrong data or no data at all. Quite often, a data element on the Details page has a corresponding prompt element. The text of the prompt does not change from one item to another. For example, an email prompt would always be “Email Address:” regardless of its position on the web page. The actual email address will always follow the prompt. In this case, we can search the email address using its prompt instead of its position on the page. To link element content to a prompt, press button. Then highlight and select the prompt on the web page. The program will modify element’s Name and Data as on the picture below. Prompts can be removed by pressing button. The tool finds a page element using its position in the document tree. The element position is specified using XPATH notation. XPath, the XML Path Language, is a query language for selecting nodes from an XML document. On some web sites the layout of the page changes from one item to another and so does the elements XPATH. If the tool cannot find data, compare the XPATH of the element on the failed page with the original XPATH. The tool allows entering multiple paths, one per line into the XPATH field. It is also possible to filter elements by id, class or text, i.e. /HTML/BODY/DIV/DIV/DIV[@class="price"]. 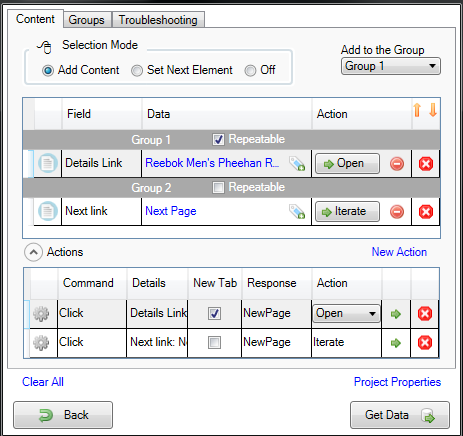 The XPATH field is available on the Element Properties screen. The Project Designer automatically assigns a default field name when the field is created. These names will appear in the final output as the column names. The default names can be changed if needed. To change a field name, click on the cell and type-in a new name. Keep the field names unique to avoid confusion. The name can be also changed using the Element Properties Window. Some information cannot be extracted directly but it is available as a part of the HTML code. For example, the product rating “4.5 out of 5 stars” on the picture below cannot be selected as the inner text. Expand the selection to include span element using the Expand button . Change the Data Capture Type to HTML. Set the Regex Filter to: title=\"(.*?)\" . The filter tells the system to extract the text between title=" and ". The product details pages on Amazon, EBay and many other sites allow visitors to view the high resolution images of the product and even zoom in by rolling over the image. This section explains how to extract an uncropped high definition image shown on demand. The Amazon product page can have a variable number of thumbnail images. The thumbnails should be grouped separately from other fields, because they are organized as a separate list. Each independent list of content should have its own group. Go to the Groups tab. Press the Create Group button. Change the Group name to “Images”. 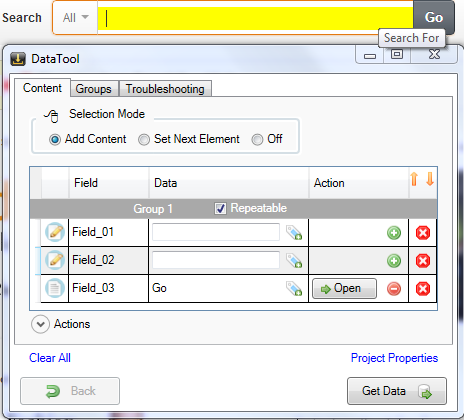 · In the Groups data-grid change the Save Data Method to “Add Columns” and the Add Column Method to “Multiple Columns”. With these options the Data Toolbar will save the data in the parent data table, but it will not duplicate the data in the parent table. Instead it will add new data columns to the parent table. This can be achieved by setting the option Save Data Method to AddColumns, which will save the image data in new data columns in the parent table (the product data table). The new group is defined as “repeatable”, which means that the program should attempt to extract thumbnail elements as the list items. · Return to the Content tab and select “Images” from the Groups dropdown. Now all new content and action elements will be associated with the “Images” group. · Highlight and select a thumbnail image in the middle of thumbnails list. That will create a new element with attached action. Expand the Actions section and change the action command from “Click” to “Hover”. By default, the browser response type is set to “New Page”. In our case, the action does not cause navigation and no new page is open as a result of the action. The actual response is a partial update of the current page. Based on that, the response type should be set to Partial Update. Setting response type is optional. Most of the time, the program is able to detect the partial updates itself and sets the proper response type. Click Open button to execute the Hover command. Executing the action will move the mouse cursor over the thumbnail image and change the enlarged picture associated with the thumbnail. The project designer will open a new template. Highlight and select the enlarged image. That will create a new element. We could have stopped here and collect the middle-resolution images 575 x 340 pixels. But we are going to collect the high-resolution images 1500 x 886 pixels available in the zoom window. To collect the image from the zoom window attach an action to content element created for medium-resolution image. Then change command type to Hover and execute the action. The browser will open a zoom window on the web page and the project designer will create a new empty template. This time just highlight and select the high resolution image in the zoom window. Rename the default field name into “Image”. The project is ready. Press Get Data button and wait for project to complete. The running project can be terminated before its completion. After all pages are processed, the program goes into the Review Data mode. You can review collected information before saving it on your computer. If, instead of the multiple records that you see on the web page, the program collects just one, press the Edit Tags button to go back and check that all of the columns that you selected belong to the same record. If you are satisfied with collected information, press the Save button. The output format depends on the output file extension. The program can save data as a CSV, XML, HTML, XLSX files or SQL script. These formats can be easily imported into an Excel, a database or into a Google spreadsheet. If you have added image collection as well, select the desired location of the downloaded images on your computer. Please note that writing directly in XLSX format is slower that in other formats, especially for large data sets. Use “Append” option to append new information to already existing data file. The duplicated rows will be automatically removed. Checking the “Open File” checkbox opens a generated data file as soon as it gets created. The Free edition limits program output to 100 records. There are no limitations in the standard edition. To access the scheduling functionality, open the Project Properties Window by clicking the Project Properties link-button in Template Editor. In the Project Properties Window set output file location and the output file type. Expand the Scheduling section and click the New Task link-button. The program will create a new task with default frequency and interval. Adjust these parameters to suit your needs and press button to schedule the task in Windows Task Scheduler. 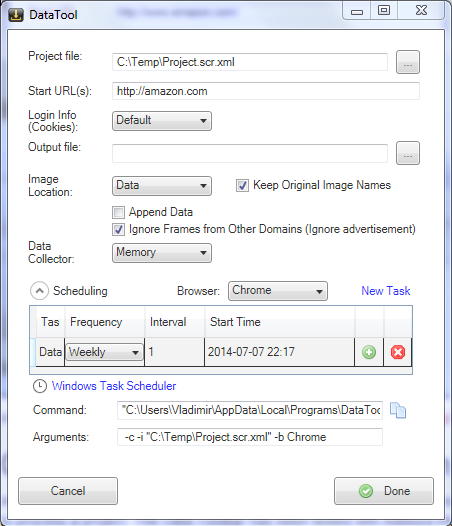 A scheduled task can removed from Windows Task Scheduler using button. Tip: By default, the command line generated by the program forces the crawler to use the current web browser. That option can be overwritten. If you need to keep the crawler in background, select PhantomJS headless browser. The PhantomJS browser does not have any UI and will not distrupt other applications. The PhantomJS browser is included in the Data Toolbar setup file. An adblocking browser extension can increase web scraping performances by stopping ads before they get downloaded. That improves page loading time and the total time required to process a project. The Data Toolbar has been tested with Adblock Plus and Adblock. The extension should be installed using a special procedure described below. The easiest way to access that folder is to use “Open product folder” menu item. Get an extension CRX files using one these download links: Adblock Plus, Adblock. When the tool runs in the data collection mode using command prompt, its performance can be further increased by using -d option, which disables images download by the browser. The option does not affect design mode.